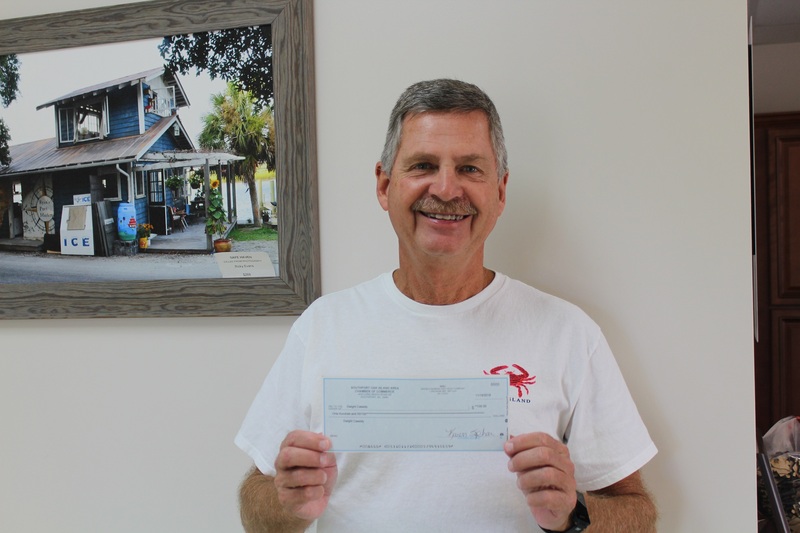 Congratulations to Dwight Cassidy of Oak Island for being the first winner in the “It’s Worth the Drive Go Local Passport” Drawing held on November 1st. Mr. Cassidy won $100 for entering the drawing by showing support of local businesses during the temporary closing of the G.V. Barbee Bridge by stopping in the Chamber’s office and presenting 10 receipts from different Southport-Oak Island area businesses. Play along and win cash with the It’s Worth the Drive Go Local Passport. The Passport may be picked up at The Chamber or at numerous local businesses which will detail the entry process. Passport pickup locations will be posted on the website www.Itsworththedrive.com . Stop by the Chamber monthly between now and April 30th with receipts from local businesses to enter the monthly drawing for $100. Another way to enter is to participate in the “Go Local Collector Puzzle”. The Southport-Oak Island Area Chamber of Commerce and Cape Fear Custom Designs have created a 9-piece puzzle with a nautical theme. The puzzle is made from maple veneer plywood and laser etched and cut locally by Cape Fear Custom Designs. Starting November 19th, residents may pick up a FREE puzzle frame and a list of businesses where they can collect the 9 pieces to complete their puzzle at the Chamber of Commerce Welcome Center, 4433 Long Beach Road, Southport or Cape Fear Custom Designs, 4979 Southport-Supply Road. To receive the puzzle pieces, a minimum purchase of $5.00 is required at each of the nine participating shops or restaurants between November 19th – January 1st. Residents who return to the Chamber and show their completed puzzles will receive four entries into the “It’s Worth the Drive Go Local Passport Drawing”.